Editing movies on the go won't be just for iPhone and iPod touch users anymore. On Wednesday, Apple announced a new, universal version of iMovie for iOS with iPad support, which will hit the App Store in time for the camera-equipped iPad 2's March 11 release. At Wednesday's press event, Steve Jobs brought Randy Ubillos—the company’s chief architect for video applications—on stage to present the newly-renamed iMovie for iOS. In his introduction, Jobs noted “[the app] is not a toy; you can really edit a movie on this thing." 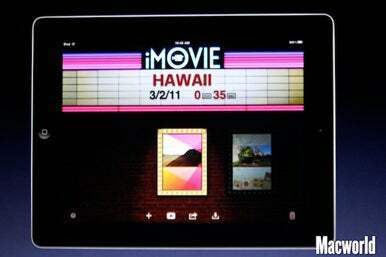 iMovie for iOS has a redesigned projects view that resembles a movie marquee. Indeed, iMovie for iOS brings over many advanced features from its Mac sibling, including a Precision Editor, multitrack audio recording, and full HD video support. You can apply transitions and pinch them open to reveal the Precision Editor to make fine edits with tap-and-drag gestures. 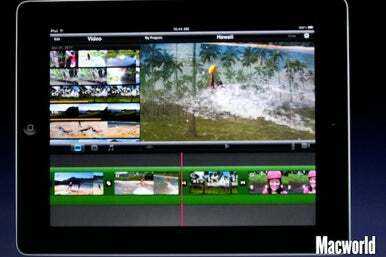 If you shoot video with an iPad 2, it will appear automatically in iMovie, ready for editing and to include in existing projects. The app has incorporated a number of multitouch gestures and social media sharing options, as well as three new themes—Neon, Simple, and CNN iReport—for a total of eight. AirPlay support allows you to stream your iMovie videos to a second-generation Apple TV, or you can use Apple's new Digital AV Adapter with iOS 4.3's new mirroring feature to play higher-res versions over HDMI to HDTVs, projectors, and other devices. You can use multitouch gestures to activate the precision editor for a more fine-tuned edit. If you'd like to incorporate photos, you can take them with either of the iPad 2's cameras or import them from the Photos app, and using face detection technology, a Ken-Burns-style panning effect will intelligently keep faces in frame. Additionally, you can use any of the new title styles available with each theme to add graphic and text overlays to photos and clips. Thankfully, when it comes to audio, iMovie for iOS doesn't skimp on the options. The app supports up to three distinct audio tracks along with an additional background audio track; on these, you can record your own sounds, pick from a library of over 50 sound effects, incorporate your chosen theme's soundtrack, or pick a song from your device's music library. Once you've laid down your audio clips, you can fine-tune it using per-clip volume adjustment, view audio waveforms, or open the precision editor for closer cuts. Start a project on your iPhone 4, but you'd like to continue the work on a bigger canvas? You can transfer projects to the iPad 2—or vice versa—using iTunes, but not, unfortunately, to the desktop version of iMovie. At the event, a representative from Apple noted that the original iPad will not be able to take advantage of iMovie for iOS; if you want to run the app, you're limited to the iPhone 4, fourth generation iPod touch, or iPad 2. For those devices, iMovie will be available March 11 in the App Store for $5. Updated at 4:00 p.m. PST with more details on iMovie for iOS's features. Updated at 5:54 p.m. PT to clarify iPad compatibility and to add information about project transferring.